Well, today was the second day of Tsagaan Sar. By Mongolian standards, we didn’t do much; by my standards, I’m full. 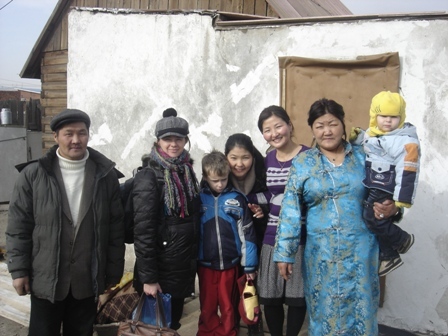 We visited three homes; I ate eleven buuz and drank more cups of milk tea than I can remember. 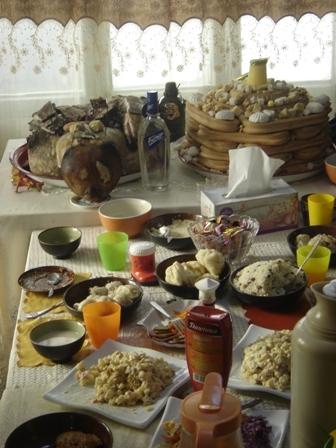 Today was the first day of the three-day Tsagaan Sar, White Month, holiday here in Mongolia. It marks the beginning of the new year, which is apparently the year of the iron rabbit or some such thing. I can never actually remember what year we’re in, but it doesn’t seem to hinder me significantly. Today was also my wife’s 33 birthday, but it tended to get overshadowed by the fact that everything else in town is closed, so we couldn’t really leave the house. We ate out a few nights ago to celebrate and then gave her some presents at breakfast today, but most of the rest of the day was not too far from a normal day for us. Then he ate an apple up to the core. Then he goes to watch TV. He watched a show; he saw a key. I don’t think I have a budding Alexander Pope on my hands, but I could be wrong. I’ve read a few “professional” poems that aren’t significantly better than that. In science, Elijah was disappointed to hear that we were doing no experiments today (our usual Thursday routine). Instead, we just went over some water facts and then spent some time explaining an experiment from last year that he still had some questions about. I spent most of my time trying to describe air’s “desire” to move from high-pressure areas to low-pressure ones. This morning, I also chatted with one of our partners in the US, trying to strategize some things for our future. I’m so glad for our support team at Spring Lake Wesleyan Church. Their team is trying to network with some of our other partner churches to build a synergy that will help us all work together better. I hope that we can really make this happen. I’m also continuing to brainstorm possibilities for countering the paternalistic dependency mindset that the church here has. If anyone has some resources to help me think more deeply about this or some action steps to suggest, I’d love to chat with you about them. I also did a bit of online chat with one of our local church members who is currently in his hometown for the holidays. He’s facing some difficult family issues, and is having to take some big responsibilities at a young age. I can’t give a lot of specifics but please help me pray about this situation. Well, 2006 is almost gone. I can tell by the nearly constant fireworks I’m hearing. And frankly, I’m not too sorry to see it go. The year had some good moments, but it seemed to hold a lot more questions than answers. I am looking forward to a clean slate in 2007 and am hoping and praying that I can make better use of it than I did this year. I only transported three people to church this morning. When the students are off-campus, nobody is visiting their contacts out in the barangays. So some of the casual attendees slack off on their attendance. Of course, a lot of people are traveling for the holidays, too. I had just picked up my last rider in the barangay and was headed back out onto the main road when one of the ladies hollered at me to stop. Mr. Ambrocio, an older gentleman, had gotten in the back of the vehicle. Neither of the fold-down seats were folded down, but he didn’t change that. He was just squatting in the back of the car, and apparently having some trouble doing so. I don’t know if he didn’t know how to fold the seats down or if he didn’t think he should change something on my car. At any rate, I talked him into moving to the vacant front passenger seat. We didn’t have our English Sunday school class last week, so we had our Christmas lesson today. Mrs. Clark taught on the story of the Magi and the flight to Egypt. Pastor Bong preached on John 10:10 in the morning worship service, and we celebrated communion together. The elements today were cookies and Coke. Grape juice is pretty expensive and not readily available, so substitutes are often used. We also ran out of communion cups, so I only had a cookie. After a nap, I got up and tried to do some thinking about budgeting for the new year. Even though I think we live pretty frugally, expenses don’t seem to fall far short of income. I know when we move back to the US this spring, we’re in for a reality check. A lot of our expenses are covered here that we’re going to have to shell out for when we get back. Hopefully, we’re able to still keep body and soul together and still have enough to give to others. I’m not losing any sleep over it. Well, the fireworks are getting louder. In just a few minutes, we’re having our new year’s fellowship here on campus. It’s not technically a watch-night service, just a little devotional time, some snack-eating and playing games. I personally would rather go to bed and get my new year started right (with a full night’s sleep) but I realize that this is probably an important event to some, and I’m sure I will have fun.